except you don't need to travel and you can study all the materials as many times as you want. since I started my business 15 years ago. 8- Updates posted to a private link on this website accessible only to DVD owners. The link to the updates page is emailed to you when you purchase the DVD. You can ask questions and the answers will be posted in the updates area. 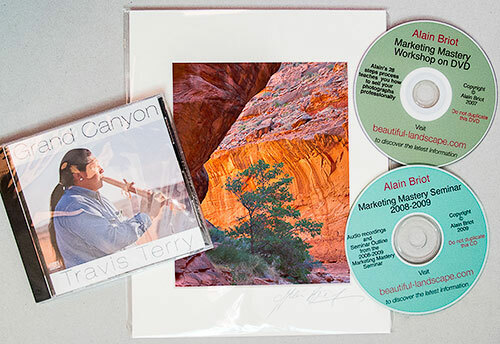 First, you receive the Grand Canyon CD as a sample product that you can create and sell in addition to your photographs. I sell this CD myself through my website, at shows, in galleries and wholesale in stores. Furthermore, I explain exactly how to create this CD, from A to Z, in the Introductory Marketing Mastery Workshop on DVD. That way you have both the explanation about how to create this product, and the sample product for your examination and evaluation. The Value of the DVD, at the recommended retail price, is $30. Second, you also receive a 5x7 Master Companion Print, museum-matted to 8x10, of one of my best selling photographs: San Juan Canyon. I selected this photograph because it is one of my best sellers and because I wanted to show you precisely how I print, mount, mat and package my work. This photograph is provided to you exactly the way it is sold to my customers, with the exact same presentation and quality. It is printed with the same care and quality as my portfolio prints, it comes matted to museum standards, and it is protected by interleaving tissue and presented in a crystal clear bag. You can use it as an example to prepare your own work for sale. The value of this print, if sold separately, is $100. This print is not available separately in this size. Third, you receive the complete audio recording of the 2-days, 2009 Introductory Marketing Mastery Seminar. This recording features each session of the 2009 Seminar, for a total of 9 hours of live audio recordings. It is the closest thing to actually attending the Seminar without being physically there. The Introductory Marketing Mastery Print Seminar Audio CD alone is worth the price of this entire package. This Audio CD is not sold separately. The value of this CD, if sold separately, is $600. This audio CD is not sold separately. It is only available with the Introductory Marketing Mastery Workshop on DVD. The Introductory Marketing Mastery Workshop on DVD teaches you the exact 29 steps – and over 100 sub-steps- that I follow to sell my photographs through a variety of venues. Each venue is described separately, together with the knowledge you need to make contact, apply, submit your work and sell your photographs (click here to see the Table of Contents). The Introductory Marketing Mastery Workshop on DVD features solid advice based on my years of experience making a great living selling photographs and serving tens of thousands of customers. My experience selling photographs is extensive,and in this tutorial I share with you everything that I learned selling my work successfully. The steps outlined on the Mastery DVD are taught in my Introductory Marketing Print Seminar. However, I included a lot of new information on the DVD that I have not previously taught during the seminar. Therefore, the DVD has actually more information and goes further into describing the process of selling your work than the Introductory Marketing seminar. Furthermore, the DVD is something you can watch and study over and over again, without the need to take any notes whatsoever. The seminar on the the other hand requires you to take notes and be physically present. Alain's experience selling photographs is not only extensive, it is phenomenal. sharing what he is doing and explaining how you can do it too. especially not a photographer who is at the top in terms of sales. The idea for the Introductory Marketing Mastery Workshop on DVD came about when I realized that my previous marketing tutorials --such as the Marketing CD, my essays on Selling photographs, or even my Marketing Seminar-- where far from being comprehensive tutorials about how to sell your photographs. These were useful tutorials, but a complete course on selling photographs was necessary. This was made clear through the countless emails I received asking me questions that the CD, the seminar or the essays did not answer. My second motivation for the Introductory Marketing Mastery workshop on DVD was that more and more photographers want to sell their work. There are several reasons for this. For some photographers it is because their work is good enough to be sold. For others, it is a way to either supplement their income or to generate their entire income. For others selling their photographs is a dream they have had for years, a dream they want to make happen now. The collapse of the stock market in past years and the uncertainty of investments in general has furthered photographers distrust of traditional forms of additional income such as bonds, stocks or even money market accounts. Finally, the current mortgage crisis has placed the last nail in the coffin of financial security for many of us. For most, owning a house, or owning investment properties, something that once was a guarantee of financial well-being, has become a financial nightmare at worst or a dormant asset at best. All this has contributed to photographers seeing a strong income potential in their photographs, in their body of work, and in their knowledge of photography. Unfortunately, something is missing and that something is the knowledge of how to sell your work. While we have many tutorials on how to take photographs, there are no tutorial that covers how to sell photographs and operate a photography business from A to Z. Furthermore, the few "marketing photography" tutorials that exists were written prior to the digital age and are therefore no longer valid today, because they are based on the now-outdated marketing model of selling film photographs. This model was developed prior to the existence of the web, email, google, digital capture, inkjet printing and so on. In other words, the few tutorials that exist tell you how to sell photographs in a world that no longer exists. They are simply no longer useful. Finally, I don't know of any tutorial that actually tells you precisely how a successful photographer sells his (or her) work. This is hard to do, because a business is by nature personal. However, creating emotional photographs and finding a personal style are just as personal. Since I have been teaching the two later subjects for years, and since I have also been teaching marketing for years, I saw no problem creating a tutorial in which I "open the doors of my photography business" so that you can learn exactly how and why I do what I do. More importantly, in the Introductory Marketing Mastery DVD I show you exactly how you can do it too. That, eventually, is the number one goal of this tutorial. If you cannot do it to, then what is the point, right? So I focus on giving you clear directions about how to do what I do. I even designed and included a step-by-step chart at the end of the DVD whose purpose is to get you started by helping you make the first steps towards selling your work, by teaching you how to set specific and realistic goals, and by having you make a success contract with yourself. The result is a DVD tutorial that will shave years off your learning curve. Instead of learning all you need to know at the "school of hard knocks," you will learn it from someone who has already attended this school and who is saying: "Do this, not that, because this works while that doesn't. I know, I tried both." Furthermore, digital is a very young medium and, as I explained, many photographers continue to sell their work by following the marketing model developed for film photography, a model that is now outdated. Few know the ins and out of marketing in the digital world. Again, here too there is room for competition and growth. Finally, I feel bad seeing photographers sell their work for next to nothing because they do not know how to get a good price for their work. You cannot run a business that way because the profits are either too small or there are no profits at all. In this DVD tutorial I teach you a precise method of pricing your work, one that takes into account all your costs and that allows you to price your work fairly for your customers while allowing you to make a good income. For me the growth and the respect of digital photography as a business depends on teaching solid marketing skills to photographers who want to sell their work. I decided to include many unique files on the DVD, files that are not available anywhere else. These files include a concept I developed and created that I call Quickstep Files. Quickstep Files are printable documents that describe each step I go through step by step, in a simple and precise manner. Quickstep files are comparable to notes you would take while listening to the tutorials (there are over 100 tutorials on the DVD) or reading one of the essays or the PDF files (over 100 PDF tutorials are on the DVD). However, these notes have already been taken for you, and all you need to do is follow them to complete each step on your own. You can even print them if you like and place them in a binder or use them as you study and practice each step. There are 29 Quicksteps on the DVD, one for each Step. A list of all the software, hardware and the supplies I use is provided, together with links to each manufacturer's website. This link is a treasure trove of information, one that took me years to assemble. As it is, you do not need to do anything except click on the links to see exactly what I use and where I get it from. Updates of the 29 steps and 100 sub-steps will be posted to a private area of my website. You will receive a link to this area when you order your Introductory Marketing Mastery DVD package. These updates will be in the form of new tutorials in audio, video and PDF format. The updates area is located on this site and can be accessed at any time. There are no limits regarding how often you can visit the updates page. My previous Tutorial CDs and DVDs –the Marketing CD, Portfolio, Composition etc. CDs --are not designed to replace attending a workshop. Rather, they are designed to accompany attending a workshop. In many ways they are designed to be used in addition to participation to the workshop, or as preparation to the workshop, or as additional work that can be completed after the workshop. In short, my other CDs and DVDs are designed to complement my workshops and not to be a replacement to a workshop. The Introductory Marketing Mastery Workshop on DVD is my second DVD tutorial which is designed to replace attending a workshop (this is why “Workshop” is part of the DVD title). The first one was the Printing Mastery Workshop on DVD which was released in 2006. To achieve this goal all the materials that are taught during the Introductory Marketing Seminar are included on the DVD. The DVD is organized along the same outline as the seminar, and features tutorial audio recordings and PDF presentations that duplicate the presentations I give during the seminar. This is why the DVD features over 90 audio tutorials, 110 PDF tutorials and numerous other files. My only CD that features movies –the Composition CD—has 2 movies. The Briot’s View CD, which is my only CD featuring audio recordings, has 8 audio files. The Introductory Marketing Mastery Workshop on DVD goes much much further by including a huge amount of audio, PDF and other tutorial files. My goal was to provide an amount of Audio and PDF tutorials equivalent to the presentation time offered during the Introductory Marketing Print Seminar. In effect, the DVD contains more information than I can provide during the 2 day seminar because in 2 days I give about 16 hours of presentations ( 8 hours a day for 2 days) while on the DVD my presentations total over 30 hours of recordings. The DVD also features the latest information about marketing photography. A lot of this information was not presented during the Introductory Marketing Seminar. It is presented on the DVD for the first time. Therefore, if you attended the seminar, the DVD will give you new information and knowledge that has not been previously available in any of my tutorials. B- You can listen to each presentation and study the materials over and over again instead of just once. C- You do not need to take notes. Quickstep files with step by step instructions of each procedure are provided on the DVD. You can even print the Quickstep files for reference. These Quickstep files are available exclusively on the DVD. ____- mp3 Files of each audio presentation - listen to them in your car, on your ipod, anywhere. With your order you receive a $100 off coupon good towards registration in any of the workshops taught by Natalie and I. This coupon has no expiration date. You can even give it to a friend if you like. The coupon is mailed to you with your order. fill it in, then email or email it back to us. 2 - The complete recording of the 2009 Marketing Mastery Seminar. This recording is not available separately. If it was it would sell for $600. 5 - The San Juan Canyon fine art print as an example of print quality, matting, mounting and presentation for a fine art print, a $100 retail value (this print is not available separately and is therefore a collector's item). 6 - The access to the DVD Updates area at no extra cost. The updates area is accessible any time you like. 7 - The opportunity to ask questions regarding marketing and to have your answers posted to the DVD updates area. 8- A $100 off coupon towards registration in any of the workshops taught by Natalie and I. Coupon carries no expiration date.